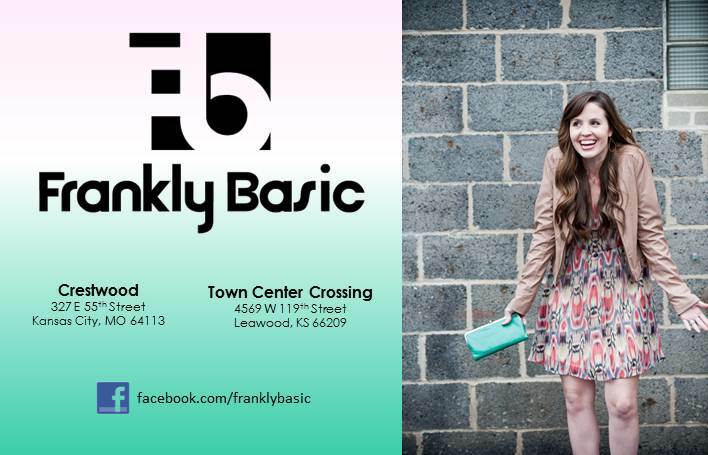 when the cool folks over at my favorite local boutique, frankly basic, asked me if i would be interested in helping promote their new spring line - you better believe i freaked the f out calmly and professionally said yes. this is my favorite spot in kc for finding affordable fashion and now that they have two locations in the metro, it is twice as nice. you might recall that we did a little feature on them HERE. check it out for a refresher course and then check out the first of four looks to get you geared up and outfitted for spring. look one: cool-la. la. it's perfect for warmer spring/summer days and cool nights when a jacket is required. plus, this is an ensemble that you can easily transition to fall/winter. and don't even get me started on that gorgeous emerald green clutch and all the gold jewelry. love it all, all year round. 1.) try things on before nixing them. 2.) step outside of your comfort zone every once in a while. once it was on, i was in love. the jacket is so soft, a perfect neutral color and the dress is the perfect daytime look for spring events and a great length for the office. i say pair with a blazer for a totally polished look. it also doubles as a great get-up for a night out on the town. add some tights and boots in the fall and you've just expanded your wardrobe with a year-round look. head on over to frankly basic and see what you'll fall for this spring. then, stay tuned for the other three looks!